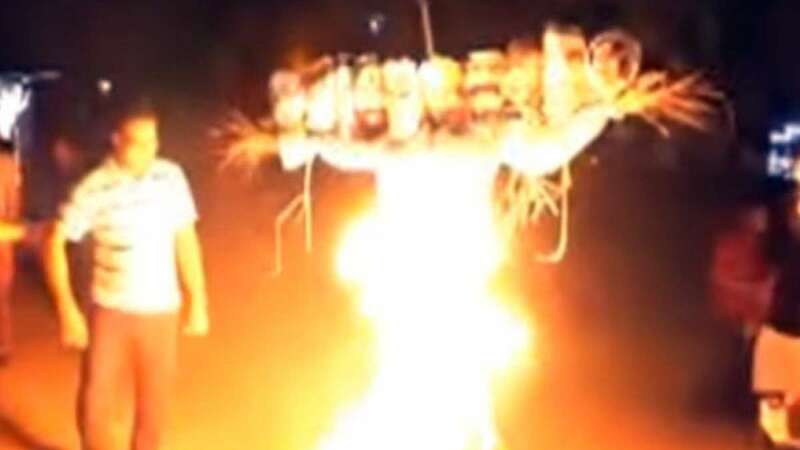 New Delhi : The vice chancellor of the Jawaharlal Nehru University has ordered an investigation into the incident of burning of Prime Minister Narendra Modi and Amit Shah Effigy in the campus on Tuesday. A bunch of Congress-affiliated National Students' Union of India (NSUI) students placed PM Modi and BJP chief Amit Shah’s face along with Pakistan's Prime Minister Nawaz Sharif, 26/11 mastermind Hafiz Saeed and several other militant organisations as Ravana's 10 faces before burning it on the night of Dussehra. A report mentioned that students put PM Modi's face on Ravana in an act of protest against Centre's failure to deliver its promises and the continuous attacks on various educational institutions across the country. The students also carried placards with slogans saying, 'Truth shall prevail over evil'. Meanwhile, Vice Chancellor Jagadesh Kumar mentioned about the incident on Twitter and also said that the probe has been initiated in the matter. "The effigy burning incident at JNU was brought to our notice. We are investigating the matter and examining all relevant information." A few days back, the university administration had ordered a proctorial inquiry into the effigy-burning of the Gujarat government and 'gau-rakshak' (cow vigilantes). # Pakistan PM Nawaz Sharif and militants were placed on the other heads of Ravana.